First I tried connecting the circuit to a 9V battery. (Multimeter reads around 8.3 Volts, which is in the operating voltage range of the LM386 as per datasheet) The result I have is lots of noise, sometimes cracks and pops and a barely audible sound of the audio input (it feels like highly attenuated form of input which is very bad). It doesn't even sound at least equal to the input! I want the gain to be around 200, so I do have a 10\$\mu\$F capacitor across pins 1 and 8 of the LM386. Initially I simply used a in-ear earphone to pick up the mono output. I also tried connecting a small speaker (pictured). It's apparently a 0.2W 8\$\Omega\$ speaker. The output is low, but the end result is similar to the earphone output.. 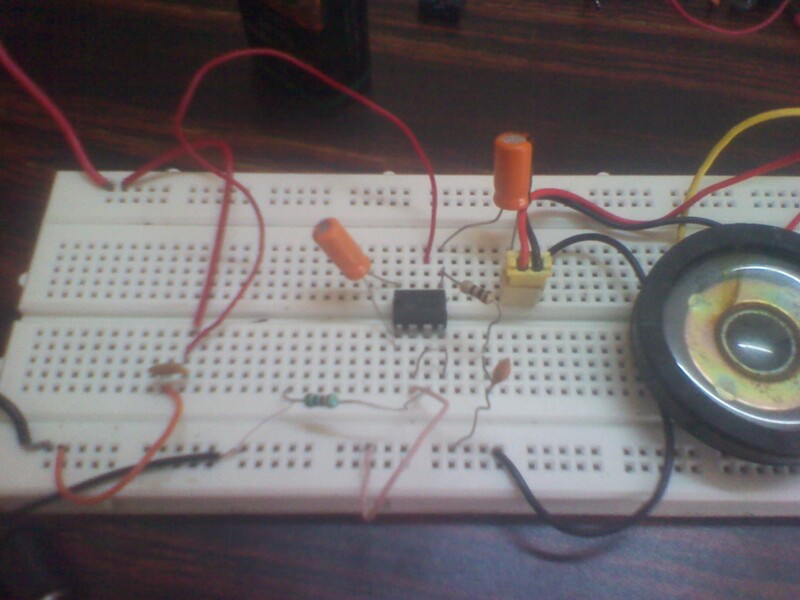 Here's a snap of the breadboard.. Sorry for the bad quality pic. This config used the DC adapter and a 0.2W 40\$\Omega\$ speaker. I even checked all parts for continuity using a multimeter. I'm also open to tips on troubleshooting this, since I'm new. Top bus is the Vs and the bottom bus is the common ground. Input audio is connected to the left end of the 'green' 1k resistor. Its a very thin wire since its from a small 3.5mm TRS cable. I don't want anything super loud, just audible maybe like 2x of the input signal. If so, what kinds of speakers would this amp be capable of driving? What would I need to make it sound acceptable? 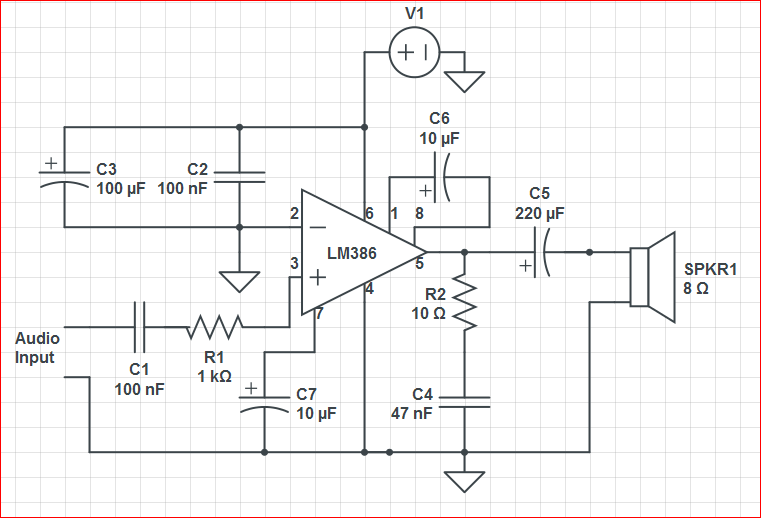 Basically, what's wrong with this circuit? UPDATE: I followed all of your suggestions and my setup now consists of an additional 100\$\mu F\$ capacitor in parallel to the power, a 100nF capacitor in series to the input audio signal and a 10\$\mu F\$ capacitor connected to the bypass pin. There was a problem though, the 9.6V unregulated adapter I use seems to show 22 Volts on the power rails (under load).. this seemed to make the LM386 run really loud. I seem to hear the amplified audio at times when I nudge some parts here, but anyhow after sometime, the IC got too hot and so did the 100\$\mu F\$ capacitor at the power supply. I can't really tell if it's all because of a bad quality adapter or the IC or breadboard or capacitors.. The capacitors were salvaged from an old PCB board of another circuit. Also since I think the last LM386 got fried, I desoldered another LM386 from another board and I'm keeping it in stock. This is the last 386 I have in hand now and I don't wanna screw this up. UPDATE-2: I seriously doubt the volume level output of this amp.. through the speakers, I don't think it plays it loud enough.. the signal sounds sort of 'amplified', but the speaker doesn't seem to output it loud. Btw, I tried 9V batteries, 9V battery with 5V DC, 7.8V DC, 5V DC all sound the same. Is it because of my speakers? Also thanks to everyone who suggested adding extra caps to the power rails.. that part really helped in filtering a lot of noise. I used a 10\$\mu\$F cap there along with the 100nF cap. Or does adding more caps cause power loss or something? 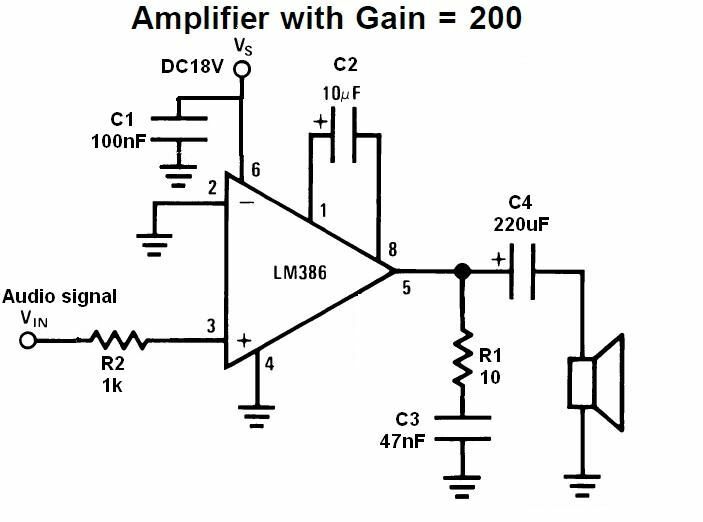 The LM386 amplifier's inputs are an internally biased differential pair, with common mode input range extending to the indicated ground, Vee, or actually 0.4 Volts below ground. In order to not disturb this internal biasing, the input signal must be capacitively coupled (or perfectly ground-referenced) - a capacitor in series on the input line is needed. Next, for a voltage gain of 200, the input signal peak to peak needs to be under 1/200 of the output voltage range of the amp. While I could not find this specified in a quick scan of the datasheet, if we assume 7 volts output voltage range with a 9 Volt supply, the input signal needs to be under 35 mV peak to peak, to avoid clipping the signal. Clipping would result in mild to severe distortion of the output - though this does not explain the complete lack of signal you find on output. 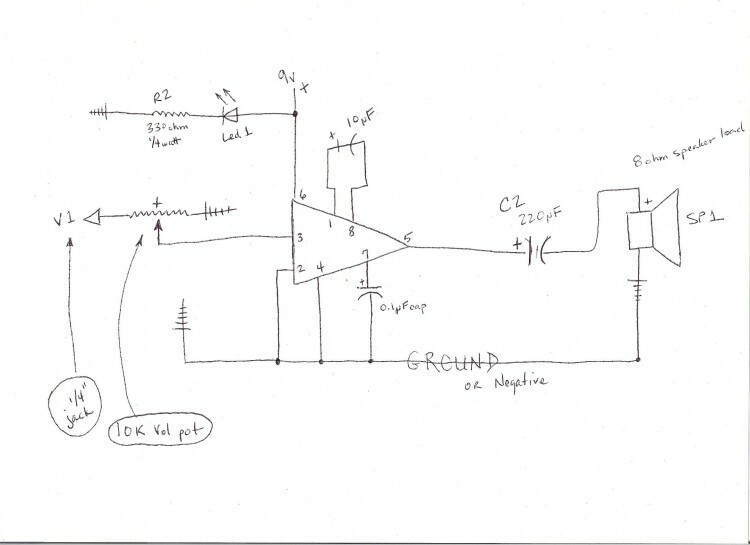 If the incoming signal is higher than this 35 mV P-P, a potentiometer as an attenuator on the input is suggested. Once these fixes are done, please revert with results, so the answer can be added to if needed. Try removing the capacitor between pins 1 and 8, you say that you want x2 output and you are using x200. Remove it so you have x20, next connect an audio device and set it to it's LOWEST volume and increase it slowly. You may also try to add a trimmer between pin 3 and ground and connect the center pin to audio device to attenuate input signal, but do not remove the input capactor. Try the following: 9 volts through on/off switch to pin 6, 16 or 25 volt 10uF electrolytic capacitor between pin 1 & 8 (positive to 1, negative to 8), a 0.01uF ceramic capacitor from pin 7 to ground, and a 16 to 25 volt 220uF electrolytic capacitor from pin 5 to an 8 ohm speaker (positive of cap to 5, negative to speaker positive). Pins 2 & 4 to ground, and all other ground terminals (jack input, power, speaker, volume potentiometer, etc). I have made many LM386 amplifiers for guitars, and the sound is great. The max output is 325mA...nearly 3/8 watt. The battery can be a standard 9 volt, or for longer lasting power, use a harness that holds 6 AA 1.5 volt batteries. An LED power-on indicator light can be added too. The first diagram you posted had no 10 uF cap from pin 7 to ground. This is a must. The Zobel network R2 and C4 must also be installed if you are using the LM386 as an amplifier. If you are using it as a part of an oscillator circuit then those two components are unnecessary. There are a number of versions of the LM386 IC and lot of suppliers only offer the N1 version. This version has a reputation for being noisy and unstable, whereas the N4 version has a much better reputation in terms of low noise and stability. Hope this helps. I had the same problem, you need to increase the output capacitor for the speaker, 220 uF is way too small, I am currently running 2200 uF, there is a lot more noise, but the output is a lot louder, two 470 uF capacitors is probably best. This needs too much components. I tried this without connecting any component with pin 1,2,3,4,6,7,8 and it works properly and have a great sound without any internal noise. Actually, we make amplifier using only one capacitor ranges (100-220uf) or may more with pin 5 but that type of circuit have too much noise, to remove this easy way that use 104 nf ceramic capacitor and 10kohm resistence are in series and the end of capacitor is attached to pin 5 and the end of the resistence is to ground. 100% surely that it works without any internal noise. Not the answer you're looking for? Browse other questions tagged audio noise lm386 or ask your own question. amplifying audio lm386 dumps negative part? Modded speakers emit high frequency noise, how to filter it out?